Mary Jane Sterling has been a mathematics teacher for more than 30 years. Part I: Trying Out Trig: Starting at the Beginning. 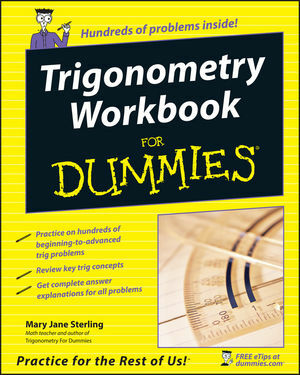 Chapter 1: Tackling Technical Trig. Chapter 2: Getting Acquainted with the Graph. Chapter 3: Getting the Third Degree. Chapter 4: Recognizing Radian Measure. Chapter 5: Making Things Right with Right Triangles. Chapter 6: Defining Trig Functions with a Right Triangle. Chapter 7: Discussing Properties of the Trig Functions. Chapter 8: Going Full Circle with the Circular Functions. Part III: Trigonometric Identities and Equations. Chapter 9: Identifying the Basic Identities. Chapter 10: Using Identities Defined with Operations. Chapter 11: Techniques for Solving Trig Identities. Chapter 12: Introducing Inverse Trig Functions. Chapter 13: Solving Trig Equations. Part IV: Graphing the Trigonometric Functions. Chapter 15: Graphing Sine and Cosine. Chapter 16: Graphing Tangent and Cotangent. Chapter 17: Graphing Cosecant, Secant, and Inverse Trig Functions. Chapter 18: Transforming Graphs of Trig Functions. Chapter 19: Ten Identities with a Negative Attitude. Chapter 20: Ten Formulas to Use in a Circle. Chapter 21: Ten Ways to Relate the Sides and Angles of Any Triangle.